There are disappearances more painful than others. People more endearing than others. Over the course of a career, over the course of meetings, inevitably, we focus. And I had attached myself to Azzedine Alaïa. How to do otherwise? His career is beautiful because of a changing material, sometimes rough, sometimes bright, elastic in any case. It took him the elasticity to make his place in a world that did not wait for him, a world that did not expect anything from a Tunisian landed in Paris 1957 at a poorly defined age. Was he born in 1936, 39, 40? "I erased age," he told me. He met fairies, as he called them, who facilitated his passage from one world to another, but his treasure he created with his hands. Hands that drew, made the canvas, cut, sewed, passed and ironed over the fabric to hear the voice of the material. Azzedine Alaïa was a real fashion designer. The first time I met him was in January 2008, almost nine years ago. It was my friends Angelo Buonomo and Didier Cometti who introduced it to me. I was both moved and very impressed. I was going to meet Master, have lunch with him, interview him for first time. And I had two pages A4 questions to ask him because I wanted to know everything about him. And he was going to give me time, hours of his time, when he had a collection to finish. I came with a box of chocolates, as at each of our future meetings. He became greedy at coffee time. Over the visits, hours of recordings, I have the painful feeling of knowing almost nothing about him. I would have liked to say more, but at each meeting he said less. He had to catch him before he left, because if he left the table, we all knew he would not come back and he would hide in the meanders of his mansion-workshop-kitchen-shop- place of exhibition-hotel of the street of Moussy. 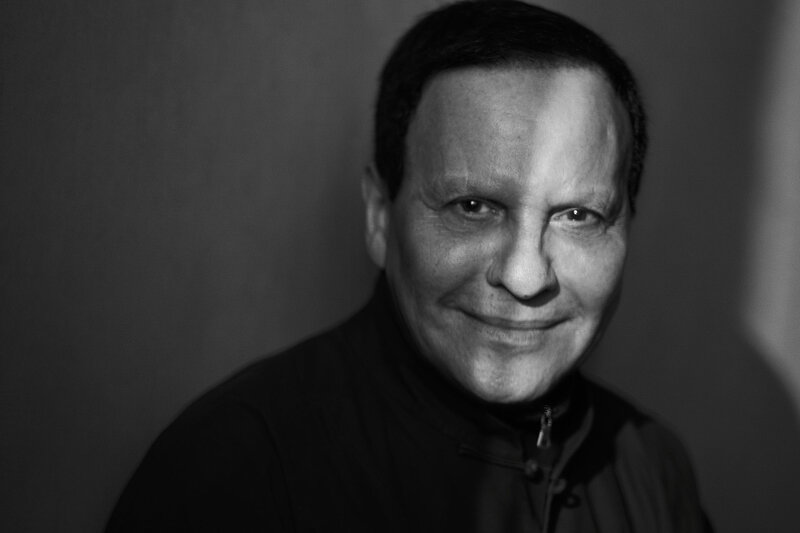 Azzedine Alaïa loved women and they gave him back. It was to them, he told me, that he owed his career. To make a list of all those who counted in her life would be too tedious, but one could start with Madame Pineau, the midwife who gave birth to her, a French woman from Trouville where he discovered fashion in magazines. She would continue with her grandmother, who raised her, then we would add the Countess de Blégiers, who has He was welcomed when he arrived in Paris, babysitting his children and sewing dresses. It should not be forgotten Simone Zehrfuss, who gave him the necessary help so that he moved to his first workshop rue de Bellechasse in 1965, an apartment populated by 18 workers and furnished with sewing machines where women's parade the aristocracy, like dancers of the Crazy Horse, Arletty, etc. In the beautiful inventory of the women of the life of Azzedine Alaïa, one would also read the delicious name of Louise de Vilmorin, that of Cécile de Rothschild who introduced him one day Greta Garbo. There would still be that of all the top models of 80 years that parade free for him, rue de Bellechasse. "Stephanie Seymour was coming from New York and she was paying for her ticket to come by," he told me. She is more than a friend, she is like my daughter. She calls me dad. They call me all dad. Because I took care of them. " I was going to forget Carla Sozzani, the founder of concept store Corso Como who never left him with a sole. This list has no end because it should add all the women who wear his dresses as one appropriates a trophy: the trophy of a free body and loved. Women walking head high, high buttocks and queens of their kingdom. All these women who have devoted themselves to Azzedine Alaïa. In 1981, when he officially launched his brand (it had been years since he had made a very good clientele that passed the word, almost like a secret), he already understood that the times have changed and that the bodies of 80 years needed to exult. It was during these years that the word appeared body consciousness. A fashion that perfectly suited this man who dreamed of being a sculptor while studying at the School of Fine Arts in Tunis. Azzedine Alaïa did not become a sculptor, but an embellisher: the bodies of women were her raw material. The second being the fabric. Wear a dress signed Azzedine Alaïa makes you want to dance. We are beautiful in Alaïa, always. Its fashion today seems obvious but at the time it was not the case. Fashion designers were not very prominent among distributors and in the specialized press, as Marylène Delbourd-Delphis explains in her book The chic and the look : "... The fashion distributor, uncertain of the reaction of the customers can not venture to take too many aesthetic risks, since it would be a commercial risk. The trend is therefore to be cautious: what could be called a "realistic average mode" (...) The fashion journals are willingly or unwilling to observe this same realism. (...) The introduction of this realistic average mode, which is as much for reasons structural than ideological creations, has slowed the public's knowledge of ready-to-wear designers who have each participated in their own way, with different aesthetic contents and targets to the upheaval of the fashion landscape. And she quotes Azzedine Alaïa in mind. Marylène Delbourg-Delphis, CEO of Cilantro Production, is one of Mr Alaïa's first-time clients and knew him at the beginning of his career. "The first time I met him on rue de Bellechasse in 1979, what struck me the most was the amused look of Azzedine. He felt that he was becoming everyone's darling, but he was a little suspicious. So if he was firmly convinced that he deserved the attention we were getting at him, he was trying to distance himself a little if it would not last. In 1979, he already made outfits for many famous women, of course, but what struck me most was his way of whispering Arletty's name. He was careful when he talked about it because he did not really know what everyone could think of what was still called his "horizontal collaboration," but he clearly had a fascination with the popular image of Arletty in the role of Mrs. Raymonde of the Hotel du Nord. "She also remembers the little dog that Azzedine Alaïa carried in a shoulder bag. In 2000, Azzedine Alaïa reached an agreement with Patrizio Bertelli, managing director of Prada to buy his own shares seven years later and resell them to the Richemont group. While many couturiers and creators have disappeared from the map, he has survived, both because of his talent, but also because he has the luxury of choosing financial partners who understood his need for freedom, without (too much) pushing it. " I wait. I'm like cowboys, with a lasso: when I find an idea, I run behind to catch it. It's hard to get an idea, by the way, "he told me. The fashion designer hated the parade system and showed his collections when it sang to him. When they were finished. That was the problem: he could have worked on a dress indefinitely. In her eyes, she was never finished. "It's never perfect, it's never finished a garment. When it has to be finished, we finish it, yes. But we can take it back, do it better each time. As we can miss it too. We never knew when we would receive an invitation card at home. "I'm out of order because my head will never be in the system. I have to leave a solid legacy for the group (the Richemont group, ed), and I prefer not to do what I do not feel, "he confided. He also said, "The world of fashion should change systems. Hardly have we finished the winter we start the summer. Which creator can follow this rhythm, make eight collections a year? I do not want to work that way. And he did not work that way, precisely. He is the only one to have resisted a system without it crushing it. Tonight, as I write, my thoughts go to Christoph von Weyhe, the painter who was Azzedine Alaïa's companion, to Caroline Fabre-Bazin and all the women who loved him, all his tribe, who surrounded him, protected, who put between him and the world the filter necessary for him to continue creating, still, always, at liberty. The first time I met him was in January 2008, almost nine years ago. It was my friends Angelo Buonomo and Didier Cometti who introduced it to me. I was both moved and very impressed. I was going to meet Master, have lunch with him, interview him for the first time. And I had two pages A4 questions to ask him because I wanted to know everything about him. And he was going to give me time, hours of his time, when he had a collection to finish. I came with a box of chocolates, as at each of our future meetings. He became greedy at coffee time. In the beautiful inventory of the women of the life of Azzedine Alaïa, one would also read the delicious name of Louise de Vilmorin, that of Cécile de Rothschild who introduced him one day Greta Garbo. There would still be that of all the top models of 80 years that parade free for him, rue de Bellechasse. "Stephanie Seymour came from New York and she was paying for her ticket to come and go. She is more than a friend, she is like my daughter. She calls me dad. They call me all dad. Because I took care of them. " In 1981, when he officially launched his brand (it had been years since he had made a very good clientele who passed the word, almost like a secret), he already understood that the times have changed and that the bodies of 80 years needed to exult. It was during these years that the word appeared body consciousness. A fashion that perfectly suited this man who dreamed of being a sculptor while studying at the School of Fine Arts in Tunis. Azzedine Alaïa did not become a sculptor, but an embellisher: the bodies of women were her raw material. The second being the fabric. Wear a dress signed Azzedine Alaïa makes you want to dance. We are beautiful in Alaïa, always. Marylène Delbourg-Delphis, CEO of Cilantro Production, is one of Mr Alaïa's first-time clients and knew him at the beginning of his career. "The first time I met him on rue de Bellechasse in 1979, what struck me the most was the amused look of Azzedine. He felt that he was becoming everyone's darling, but he was a little suspicious. So if he was firmly convinced that he deserved the attention we were getting at him, he was trying to distance himself a little if it would not last. In 1979, he already made outfits for many famous women, of course, but what struck me most was his way of whispering Arletty's name. He was careful when he talked about it because he did not really know what everyone could think of what was still called his "horizontal collaboration," but he clearly had a fascination with the popular image of Arletty in the role of Mrs. Raymonde of the Hotel du Nord. "She also remembers the little dog that Azzedine Alaïa carried in a shoulder bag. The fashion designer hated the parade system and showed his collections when it sang to him. When they were finished. That was the problem: he could have worked on a dress indefinitely. In her eyes, she was never finished. "It's never perfect, it's never finished a garment. When it has to be finished, we finish it, yes. But we can take it back, do it better each time. As we can miss it too. We never knew when we would receive an invitation card at home. "I'm out of order because my head will never be in the system. I have to leave a solid legacy for the group (the Richemont group, Ed. ), and I prefer not to do what I do not feel, "he confided. He also said, "The world of fashion should change systems. Hardly have we finished the winter we start the summer. Which creator can follow this rhythm, make eight collections a year? I do not want to work that way. " And he did not work that way, precisely. He is the only one to have resisted a system without it crushing it. In 2000, Azzedine Alaïa signed an agreement with Patrizio Bertelli, managing director of Prada to buy back his shares seven years later and sell them to the Richemont group. While many couturiers and creators have disappeared from the map, he has survived, both because of his talent, but also because he has the luxury of choosing his financial partners who understood his need for freedom, without (too much) pushing it. "I wait. I'm like cowboys, with a lasso: when I find an idea, I run behind to catch it. It's hard to get an idea, by the way, "he told me. Tonight, as I write, my thoughts go to Christoph von Weyhe, the painter who was Azzedine Alaïa's companion, and to all the women who loved him, all his tribe who surrounded him, protected, who put between him and the world the filter necessary for him to continue creating, still, always, at liberty.